Along with his Bear Cave Entertainment Center, a giant, temperature-controlled tent at Bear Creek Resort, and The Cave, a 380-something-seat Village Theater on Village Drive refurbished into a live event theater, developer and Big Bear aficionado Dave Stone opened the Wine Room at his Wolf Creek Resort. The Wine Room is just what you’d expect from the name: a place to enjoy fine wines. However, Stone is also offering private-stock brews, entertainment and more. “The credo of ‘What can we do for the community?’ is what we’re using to guide us,” Stone said. “We will benefit, but we want to make sure we’re providing the types of entertainment residents, second-home owners and visitors want to see. It’s their theater and we want them to enjoy the acts, events and shows we offer. What type of acts will be booked in the Stone venues? Talking with the event promoter, he turned the question back on Big Bear residents, second-home owners and visitors to answer. Readers with suggestions for entertainment to be booked may email to: editor@bigbearvillagevoice.com. The information will be forwarded to Stone and pianist and entertainer Mike Cross, who Stone recently tapped as his entertainment director. In addition to live music, Stone said he and Cross are considering comedy acts, renting the spaces for meetings, conventions and local to local organizations, live theater, magic shows and much more. The Cave will offer a backdrop screen for projections, making the space extremely functional for any type group. When not serving as entertainment director, Cross’s group, The Real Jazz Trio, with Mike on keys, Steve Boggio on percussion and Mark Cade on string bass, will be a Wine Room staple. The club will be open weekends. When the Village venue, The Cave, opens sometime in June, Cross will also work to book and promote acts on the new stage. The Cave was set to open in May; however, once started into the refurbishment of the aging Village Theater, Stone decided to make the club more ornate than originally planned. He is adding touches such as granite countertops and a Mosh pit at the front of the stage. “It’s going to be a great place to see shows,” Stone said of The Cave. 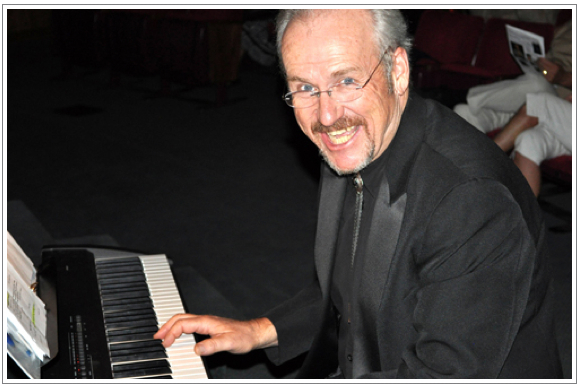 For more on Mike Cross visit pianobiz.net.